Previously, I’ve talked about how setbacks encourage land consolidation. Today I want to take a moment to look into the history of where setbacks came from. Before technology allowed the working person to affordably and comfortably travel long distances every day, commuting took place on foot, and the rich and poor were forced to live among one another. In any city of decent size, cities were crowded, and space was at a premium. A few of the extremely wealthy lived in the country, commuted into the city and stayed during the week, but most people lived close to where they worked. In the early 19th century when steam ferries became an affordable and fast mode of transport, land developers would buy relatively cheap and inaccessible land along the waterways of cities. The developer would connect it via ferry to the city then hire a surveyor to plat out streets and lots to get a much money as possible out of it. This process was much more rudimentary than today; streets were laid out just by clearing any large stumps and stones out of the way. Land developers didn't concern themselves with utilities like plumbing and sewage, which would have been considered luxuries. Once you had a mass of people (many who would prefer it if they didn’t have to take a ferry into the city every time they wanted to go out), and there were very few (if any) restrictions on what you could do with a lot, businesses and local industries popped up. The point to note here, is that even if the land was initially cheap and plentiful, there was nothing in place stopping these “ferry suburbs” from growing into cities of their own right, along with all the problems (crowdedness, poverty, the smells) and joys (wealth, economic diversity, and amenities) that came with it. This is how the waterfront neighborhoods of Brooklyn and Jersey City developed. Trains began to take off around the time of the civil war. Commuter trains offered a comfortable and fast way to travel long distances, but only the wealthiest of residents could afford the fare. For those who could though, the train offered the promise that you could make your money in the city but retreat every day and raise your family in a country manor like the gentry of Europe. These railroad communities wanted to become the opposite of a city. Instead of crowds, they wanted space. Instead of neighbors, they wanted solitude. One of the first of these suburbs was Llewellyn Park, New Jersey. Llewellyn Park was inspired by New York City’s Central Park with its winding paths and ornamental trees. Homes were to be nestled among the woods. To ensure that Llewellyn Park would forever retain its country feeling, homeowners were required to sign covenants that prevented lot sizes from being smaller than an acre, required every home be set at least 50 feet back from the street, and prohibited commercial activity. Owning land and not using it productively has long been a form of conspicuous consumption. Restrictive covenants that required a yard but prohibited using it commercially was an effective way to ensure your suburb stayed economically segregated. At the very end of the 19th century, we began to see magazines promoting country living that had nothing to do with agriculture. A detached house on a plot of land became a dream for the rising middle class to aspire to. Unlike the commuter railroad, the streetcar was affordable to the working family. Fares were often set by law (5 cents), encoded into the charter that authorized the company to build down the public right of way. Streetcars unlocked near endless land for developers to subdivide. With no shortage of land, developers competed with one another to attract the waves of middle-class Americans leaving the urban core. The fad of the day was a detached house with a yard, even if it meant there was only a gap of a few feet between your house and your neighbors'. In the early 20th century, we saw setbacks with practical uses, such as being wide enough to accommodate a car. As the car became more common, yards grew larger. Levittown, New York, a model of affordable mass-produced suburban housing, offered a generous yard around all sides of the house. What started as a sign of conspicuous consumption trickled down and became a working-class expectation. During the 1920 and 1930s, a generation before this dream was within the reach of the working class, cities across the United States adopted zoning ordinances to protect the affluent single-family neighborhoods. In actuality zoning was a device to keep poor people and obnoxious industries out of affluent areas. And in time, it also became a cudgel used by suburban areas to whack the central city. Advocates of land-use restrictions in overwhelming proportion were residents of the fringe. They sought through minimum lot and set-back requirements to insure that only members of acceptable social classes could settle in their privileged sanctuaries. Southern cities even used zoning to enforce racial segregation. And in suburbs everywhere, North and South, zoning was used by the people who already lived within the arbitrary boundaries of a community as a method of keeping everyone else out. Apartments, factories and “blight,” euphemisms for black and people of limited means, were rigidly excluded. I have heard all kind of claims as to why we have codified setbacks into our zoning laws and why it’s imperative that we keep them: Fire prevention (many American cities experienced a Great Fire before 1900 but didn't immediately adopt setback requirements), public health (modern sanitation and eliminating horses have eliminated most urban diseases), and emergency access to backyards (why is this a non-issue in urban areas?). 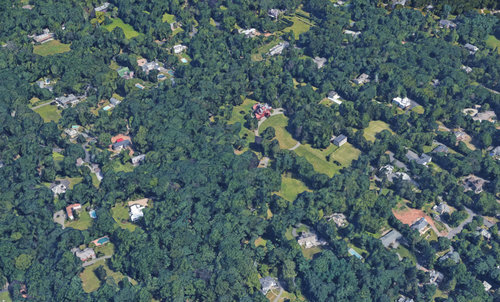 Other than several 19th century authors who promoted the health benefits of living in the countryside, I’m having a hard time to find any reputable author or research justifying arbitrary 20 foot spaces between rows of suburban houses. There is nothing wrong with detached houses if that’s what you desire to live in. But, as we come to discuss the problems concerning housing affordability, housing diversity (especially regarding the missing middle), transportation and urban design, it is important that we have some background information if we wish to constructively criticize the rules that dictate how we build our places.